Great, informative video on the Loyalty Reward Program with DoTERRA! I received Doterra’s Purify blend in my August Loyalty Rewards order, and wow, do I love it! I made a purifying room and fabric spray to replace Febreze, and I have also been adding 3-5 drops to the washer when I’m washing laundry. Can’t get enough of it! For the room spray, I bought a small spray bottle that was $1 in the Target travel/to go isle. I added 15 drops of Purify, and 10 drops of Lavender then filled the rest with water ( Distilled is preferred) Voila! Just shake a bit before each use, and don’t stop at Lavender. 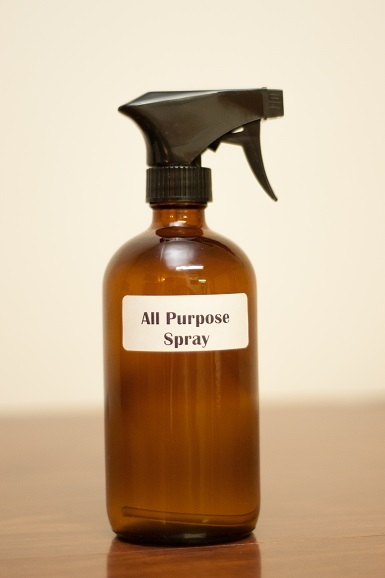 You can use any oil you want to create a lovely smelling spray! 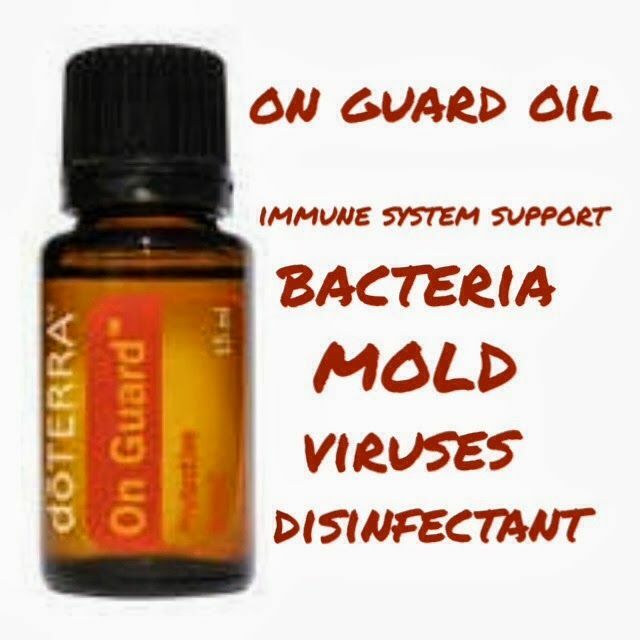 I have a 10 month old baby, and usually whenever I would do cleaning around the house I would make sure it was during nap time, because I didn’t want her breathing in the harmful chemicals that popular cleaners contain…I love DoTERRA because I can clean my house with peace of mind in knowing that we aren’t being exposed to chemicals. No need for the gloves and mask here!! 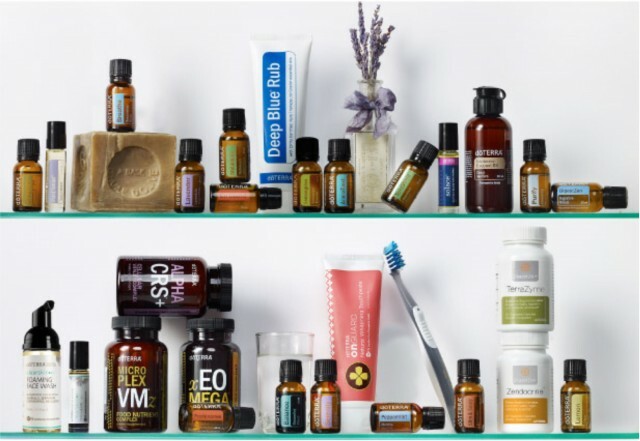 Not only does DoTERRA provide amazing Essential Oils, but did you know they have products that can totally transform your medicine cabinet, laundry room, and your beauty routine!? Doterra has an oil for every ailment and you can replace any prescription or over the counter drug with Doterra’s essential oils. They are cheaper, safer and more effective! Hey Everyone! I wanted to take a break from my usual post to let you all know that there are only two weeks left for the July promotion with DoTERRA! 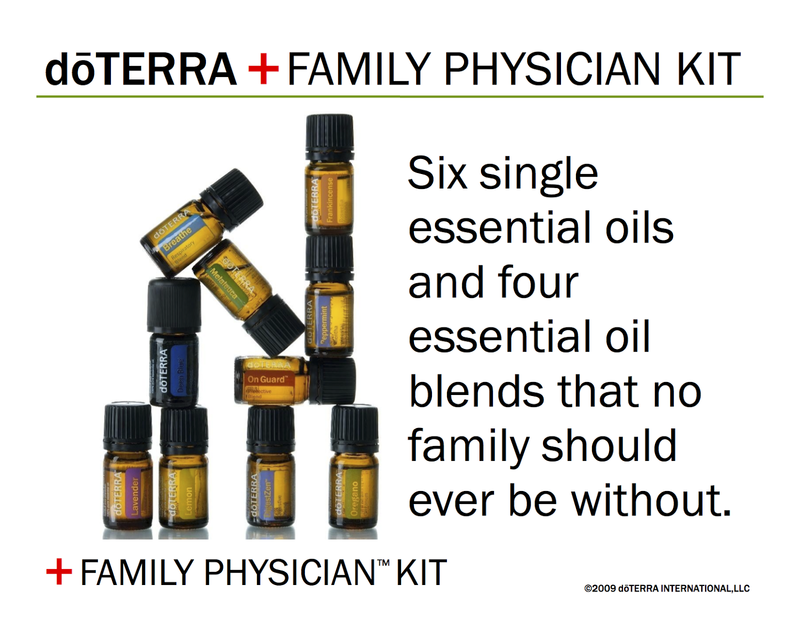 If you enroll as a Wellness Advocate during July, and purchase an oil kit, that is over $100, such as the Family Physician Kit ( The one that I started with, $150) you will get $50 in free product credits and your membership fee, normally $35 will be included in the kit! Plus, when you become a member with DoTERRA you will always get your oils 25% off retail! If you have been wanting to try DoTERRA oils, or start an in home business, like me, now is the perfect time!! I absolutely love my Family Physician Kit, It includes a 5ML bottle of Lavender, Lemon, Peppermint, Melaleuca ( Tea Tree) , Oregano, Frankincense, Deep Blue®, Breathe, DigestZen® and On Guard®. Plus a 15ML of Slim and Sassy. An especially inviting, softly floral and sweet oil! Clary Sage can have a deeply soothing effect on nervous tension in both men and women. Well known for having a natural affinity with the female reproductive organs, Clary Sage is strongly Yang and thus helpful for balancing excessive Yin states. Clary Sage is known to be especially helpful for relieving premenstrual tension in women. It has a balancing effect on hormones! Clary Sage has a reputation for easing painful contractions during labor and birth. Traditionally Clary Sage has been added to Geranium essential oil to help regulate and relieve female complaints associated with hormonal imbalance, such as irregular menses, menopausal symptoms, headache, nausea and depression. Stimulates lucid dreaming and clear insight through your intuition! A stimulating, regenerative and revitalizing oil excellent for treating nervousness, weakness, fear and depression. Promotes long lasting tranquility, warmth and aliveness. Clary Sage nourishes your soul, dispels negative thoughts and emotions and helps you get through challenging and difficult circumstances. Clary Sage promotes healthy circulation and is helpful in balancing circulatory conditions like high blood pressure and varicose veins. 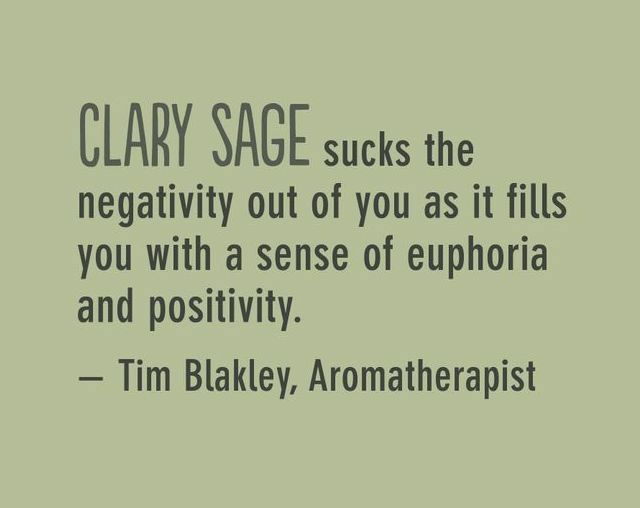 Clary Sage is especially helpful for relieving stressful or tense physical and emotional states. Use in a hot compress to relieve menstrual and intestinal cramps, as well as stomach, liver and gall bladder conditions. May be useful for relieving migraine headache. According to Ayurvedic Medicine, an ancient system of healing practiced in India, sweet aromas such as Clary Sage are used to regulate and pacify both Vata and Pitta imbalances. Symptoms of Vata imbalance are premenstrual syndrome, insomnia, nervousness and anxiety or worry. Symptoms of Pitta imbalance include feelings of frustration and anger, tendency to emotional upset and over reaction, high blood pressure and an inability to relax and go with the flow. CAUTION: As Clary Sage can make some people feel exceedingly woozy and faint please avoid using it with alcohol, or when driving or needing to focus. Because of its hormonal effects avoid Clary Sage during pregnancy, or when nursing unless under the direct supervision of a qualified professional aromatherapist. Due to its estrogen-like effect it may cause complications with conditions sensitive to estrogen. Summer is here, and along with that comes those pesky mosquitos! I live in Southern Louisiana, so I know all too well about them! The problem with popular insect repellents is that they are full of harmful chemicals. Below is some info on this popular chemical additive that is in most insect repellent products. DEET (also known as N,N-diethyl-meta-toluamide ) is an additive in many insect repellent products used to repel biting pests. Sounds great right? Prevents bites, so what’s the problem? Well it’s not all that pretty. DEET has also proven to be harmful when consumed, inhaled, or used in excess. You better believe those toxins and pesticides in bug sprays are absorbed and eventually enter the bloodstream potentially creating awful side effects. Have you even read the warning labels on a can of bug spray? The EPA clearly states: “Do not apply to eyes and mouth, and apply sparingly around ears. When using sprays do not spray directly onto face; spray on hands first and then apply to face. After returning indoors, wash your child’s treated skin and clothes with soap and water or bathe.” And the Centers forDisease Control: “Do not allow young children to apply insect repellent to themselves; have an adult do it for them. Keep repellents out of reach of children.” SCARY! 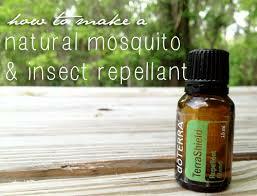 Here is an easy DIY recipe for all natural bug repellent, that works!! Directions : Add 15-30 drops (depending on the size spray bottle you use) to a spray bottle, and fill the rest up with Distilled water and spray away! !